As we near the end of the year the temptation is always to look backwards at the last 12 months, so it was nice to be asked to look forward and write something on the trends in PR for 2014. When it comes to making predictions I’m basically in the Paul Gascoigne school of thought – “I don’t make predictions and I never will” – but the CIPR asked for my views and I gave it my best shot. 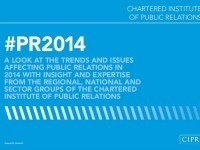 The CIPR PR Trends 2014 report is the brainchild of president elect Stephen Waddington (@wadds) as part of his election pledge to foster a stronger sense of community within the organization. I think it’s a fine idea and the end product offers a strategic look at not just each sector group within the CIPR, but (in my view) more importantly each region across the county. I gave my views on the North East on page 22 (in black & white soft focus no less) and it was great to be alongside some other communicators who I really admire including Rachel Miller, Laura Sutherland, Erin Portsmouth, Sarah Pinch and of course Stephen Waddington. I hope you all had a great Christmas and don’t worry I’ll be looking back over the best of 2013 in the next blog.